The ARRL September VHF contest comes with uncertainty. Will there be any residual sporadic E (Es) propagation left over from the summer? Will the weather in Western Washington be sunny, dry and beautiful, or cold, wet and dismal? The weather question is a big one for the Pacific Northwest, as we are frequently transitioning between spectacular summer weather and gloomy fall weather. This year, the weather forecast was for spectacularly sunny and warm for the contest weekend. I made big plans to split my roving between driving and flying between grids, something I haven’t done for a couple of years now (except for a recent 6m Sprint). But as the weekend of the contest rolled around, things at work were very busy and time consuming. Soon it became clear that I didn’t have the free time to realize both modes of roving. I had time to get the truck rover in order, but I needed a few more hours than were available to get the airplane rover in shape and do the planning for new routes. I made only a few modifications to my June VHF Contest route. Specifically, I tried out a new CN88 spot that would get me away from the RF noise I experienced in my usual location at Lake Stevens High School. That changed the schedule a bit for Sunday. Again…pretty much the story from June. One major change since the June VHF contest was the addition of a dedicated rig (FT-857) for the Elecraft XV222 222 MHz transverter. Previously, a Kenwood TS-480SAT did dual duty as a 6m and 222 MHz rig, but the effort to change between the bands made it difficult to optimize either band. The equipment rack included two FT-857Ds (2m, 432 MHz from one and 222 MHz from the other), one TS-480SAT (6m), a dual band Alinco FM rig, an Alinco 6m FM rig, and a Jetstream 222 MHz FM rig. That’s six separate microphones, something that requires severe discipline in systematically placing a microphone on the assigned hook. Two rotor control boxes (rear and front) can be seen as well as a digital recorder, paddle, antenna relay switch box, and key switch box. Two FT-857D and the TS-480SAT heads were remotely mounted on the dashboard. Cell phones provided grid information and a 24 hour clock. Early Saturday morning, I heard a news report that the intersection of I5 and US 101 was closed for an expansion joint repair, and that long delays were expected. Oh great! I had three passes through that intersection. The first was my trip to Ocean Shores for the start of the contest. The second one was simple to avoid, and the third one was very early in the morning on Sunday morning. In any case, I spent a few minutes re-programming the GPS with some alternatives to avoid that intersection. It meant I was late leaving home for Ocean Shores. I arrived in Ocean Shores (CN76) with about 15 minutes to prepare for the start of the contest. Things started out pretty well. I first worked Mike, KD7TS, on Mt. Pilchuck in CN98. Next came John, KF7PCL, who lives nearby in CN76. We worked 6m, 2m, and 432 MHz. I caught a couple more stations on 432 MHz after that. The biggest surprise was working K7AWB in DN17 on 6m. Things worked pretty well on 2m and 432 MHz, but 6m and 222 MHz were a challenge for reasons I still cannot fully explain. Six meters just seemed very noisy. Next was CN77 a couple of miles to the North. This was largely a bonanza of 2m QSOs with a few 432 MHz and 222 MHz QSOs and a handful of 6m QSOs thrown in. I circled back in to CN76 to work Eric, N7EPD, on three bands, and even caught his neighbor Rick, N7EHP, on 2m. 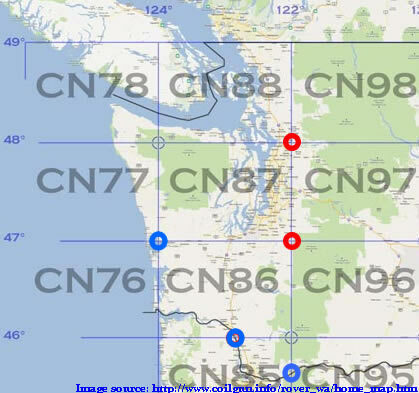 I planned a route out of Ocean Shores that took me through CN87 and CN86 very close to the CN76/CN77/CN86/CN87 intersection, with hopes of working John, KF7PCL, on three bands in two new grids. That worked exactly as planned! This burst of activity was followed by a long drive through CN86 to Kalama, WA that yielded only a few occasional QSOs—about 7 in two hours. Checking the antenna load while in motion through CN86. Things picked up when I arrived at my spot at 1,700′ in Kalama in the late afternoon. Six meters was still not working well, but I managed numerous QSOs into both CN85 and CN87 on all four bands. KB7ADO showed up from CN86 and we worked 2m, 222 MHz and 432 Mhz. Set up near Green Mountain in CN86. As evening approached I traveled about 5 miles south to CN85 where I worked many of the same stations in CN87 and CN85. From this location, I was able to work some other interesting stations, including KF7PCL in CN76 on 6m, KB7Q in CN93 (Bend, Oregon) on 2m and 432 MHz, WE7X way up in CN78 near Port Angeles, WA on 6m, and KD7HB north of Redmond, OR, in CN94. Sunset from near Green Mountain in CN85. The last stop of the day was an hour and twenty minutes away in Bonneville, WA, just over the CN95 border in the Columbia River Gorge. Upon arrival, I found Etienne, K7ATN, and Rachel, K7NIT (FM only category), Lou, WA7GCS, and a couple of other CN85 stations. The only non-CN85 station was Paul, K7CW, in CN87, who is still the only CN87 station to work me from this rather rock-enclosed location (this was his second time). It is a long and lonely trip from CN95 to my hotel near Centralia. I sometimes work a station or two in CN85. This time, I was pleased to work Mike, KD7TS, on Mt. Pilchuck (CN96) on 2m from I5 while in CN85, and then we worked on 2m, 222 MHz, and 432 MHz after I crossed into CN86. I hit the hotel and was in bed by 12:30 am, only to get up again at 5:30 am for a quick shower and to hit the road at 5:50 am. My destination was CN96 at 3,200′. On the hour and forty minute trip there, I worked the early-risers club, including Tom, KE7SW, on 4 bands, Jim, K7ND, on a number of bands, and Jim, W7FI, as well as a few others. This spot near the CN86/CN87/CN96/CN97 intersection is always quite productive, even at 7:30 am. I wasn’t able to awaken anyone in CN85, but a number of interesting stations popped up elsewhere, including John, VE7DAY, in CO70, Rod, WE7X in CN76, Mike, KD7TS, in CN98, Michael, KB7W in CN93, and Michael, W7QH, in CN84. From CN96, I made a brief stop at 3,000′ in CN86 (again). Considering that I had already spent hours in the grid the previous day, this stop provided a surprising number of new multipliers including VE7DAY in CO70 on 2m, WA7BBJ in CN97 on 6m and 432 MHz, KD7TS in CN98 on 6m, N6ZE/R in CN88 on 222 MHz, and WE7X in CN78 on 432 MHz. The next stop, a few miles down the road, was a return to CN87, at about 2,000′ feet. This short stop provided plenty of QSOs into CN87, CN88 and CN98, but no new multipliers. About 30 minutes away from there was the CN97 stop at the CN86/CN87/CN96/CN97 intersection, on Mud Mountain at 1,200′. This stop was remarkably productive with 55 QSOs into CN78 (WE7X), CN87, CN88, CN96 (N7BUS), CN97, CN98, and CO70 (VE7DAY). Activating CN97 from Mud Mountain. The power lines go to a nearby hydroelectric generation facility. From there, I had to travel 2 hours, mostly through CN87 and into CN88. The CN87 part of the trip produced 2 QSOs. Once I hit CN88, however, there was plenty of work to do. The CN88 stop was the only new location I tried this contest. It is on a small pull-over on a rural highway and gets me up to 600′. In all, CN88 produced 50 QSOs, with two new multipliers from VA7FC in CN79 on 6m and 2m. The last stop of the day was Mt. Pilchuck at 3,000′ in CN98. The stop was at a location some distance from Mike, KD7TS, who spent the weekend on a shelf off the side of Mt. Pilchuck. We worked two bands while I was en route, winding my way up the mountain, and the other two shortly after I got there. Mike then stopped by for a visit on his way home. With less than 2 hours remaining, he had pretty much tapped out the region, and had a long drive home. The grid was quite productive for me with 64 QSOs and three new multipliers: WE7X in CN78 on 222 MHz, and NL7B/R in CN77 on 6m and 2m. The total number of QSOs was 476, for 635 points. That makes a total of 43 grid-band pairs. To that we add ten multipliers for the grids activated for a total of 53 multipliers. The final score was 33,655 (before checking by the ARRL). Last year I had 36 grid-band pairs and ten grids activated for 46 multipliers, and 607 points for a raw score of 27,922. There were fewer rovers this year. I found NL7B/R, AL1VE/R, N6ZE/R, KA7RAA/R and K7IP/R, although most of them were not on, or were out of range of western Washington for most of the contest. Last year there were eight rovers, most of them quite active throughout the contest. It was an enjoyable contest, where most everything worked well.